We took a quick glance at the new nForce 780i SLI chipset motherboard just before Christmas in our first look. Since, we've confirmed that only XFX will offer the reference design in the UK and Europe, with EVGA covering the United States. There are less partners involved in the reference design this time around, unlike with the nForce 680i SLI which had half a dozen typically graphics companies joining the motherboard fold to sell the same board. Instead, we have a far greater differentiation from a range of Tier 1 motherboard manufacturers like Asus, Gigabyte, MSI and Foxconn with nForce 780i SLI. We've also heard more about the NF200 chip that permeates the new nForce 700-range - instead of just being just a splitter chip for PCI-Express 2.0 there's actually some clever engineering in that little bit of silicon, predominantly concerning SLI. 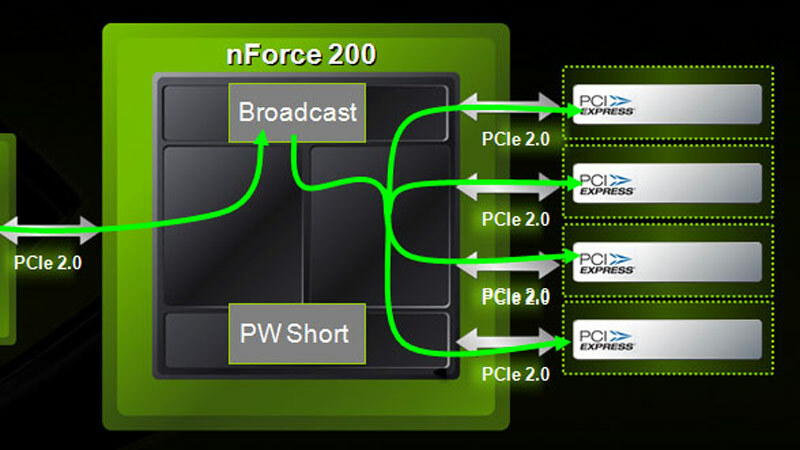 Apparently when the nForce 700-series launched there were certain patents pending, so Nvidia couldn't talk about it in the depth it would have liked. These new features include a Posted Write Shortcut, which allows data from one graphics card to be passed directly to other cards without having to navigate back to the CPU, reducing the need for several stops and a lot more latency to the journey. This should particularly help in simple two-card SLI setups, which are now controlled entirely by the NF200 chipset, however it won't help in the new 3-way love-fest as much. 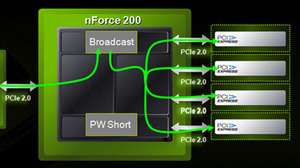 There's also a CPU Broadcast function that iterates commands from the CPU to multiple graphics cards connected to the nForce 200 in a single turn, again reducing command latency. The NF200 chip is connected to the chipset with just a single PCI-Express 2.0 link, but it should still be more than enough considering graphics cards don't even fill a normal 1.1 link. That said, it does kind of invalidate the half the reason of upgrading to PCI-Express 2.0. Both the NF200 features are designed to reduce traffic between the chipsets as well as reduce command latency. Does any of this make a real difference though? Or is the nForce 780i SLI just simply too much of an nForce 680i SLI clone? 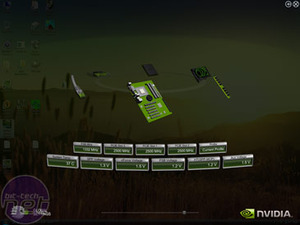 Currently out in beta here, Nvidia system tools have been updated to include ESA support for Nvidia 700-series motherboards. If you're unfamiliar with ESA, or Enthusiast Systems Architecture, then check out our preview for more information. There are a few parts to the Nvidia software; for starters there’s the System Monitor which is the main hub and does exactly what it says on the tin. Loading it up presents you with a 3D interface of all the components spinning around a central axis, revealing their status. It's very elaborate, excessively so, but it makes for something good to show off at least. At first there's the inevitable "Wow, this is cool", only to realise that it lacks actual usability since it takes up your entire screen and looking at each, individual component separately is labour intensive and inefficient. What it does do right is potentially tie in your whole system to a hub - providing you invest in an ESA case, PSU, watercooling kit or air cooling heatsink, Nvidia graphics card and EPP memory to get the full effect. Are you really prepared to buy everything again, and restrict your purchasing decision to buy certain ESA kit? There are certainly pro's and con's to the entire equation. 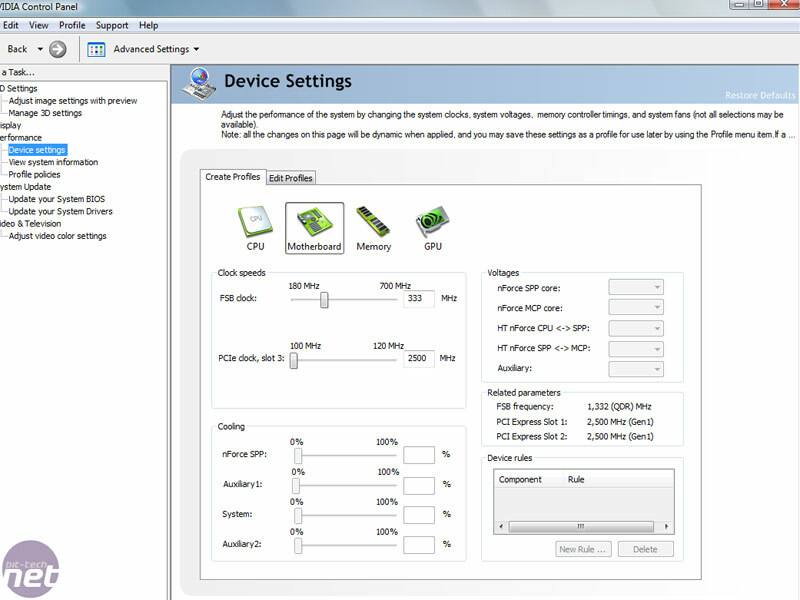 The software also offers an event logging function so you can monitor selected parts in the background, and thankfully it still has an updated set of desktop graphs that provides far better usability. 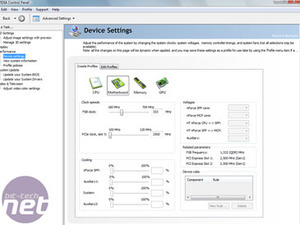 There's component name customisation so you can differentiate between parts – like two identical hard drives for example, and generally everything is there on your desktop at a glance. Unfortunately this currently doesn't work too well - it should just switch by clicking the arrow in the top right, but that simply minimises the 3D instead. Ideally there would be a Vista Sidebar option too, for those of us that want to streamline it into our other desktop applications. 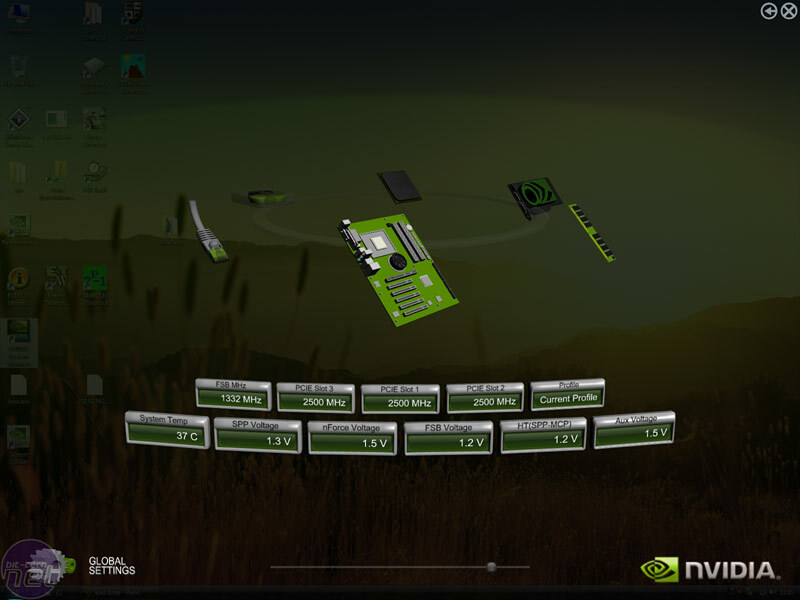 The control panel is certainly very good - it's not held back by Taiwanese "design" (I use the word loosely in terms of motherboard software) and is very easy to navigate, like all Nvidia software previously has been - task list drop down on the left, device settings on the right. Currently it's still very beta though - the reported status of many system functions was clearly wrong and some parts just simply don't work at all. ESA is still a very young initiative, but with the likes of hybrid SLI and further core hardware features arriving in the next six months, it might become a platform worth investing in.